Now Registering for Summer Camps. Click HERE for more info & to register. Greensboro Ballet's mission is to inspire, invigorate and excite our audiences and our artists through the exciting, ever evolving art of Classical Ballet. The School of Greensboro Ballet is the only non-profit ballet school in the Greensboro area and one of a relative few in the country. Our goal is to offer the finest dance education to children of all ages and adults. At SGB, your child will learn the art of dance in an environment of both discipline and fun! Greensboro Ballet is a company of professional dancers who share the love of expressing human thought and emotion through the international language of ballet performance. 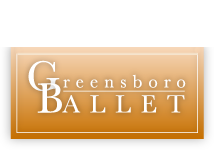 The School of Greensboro Ballet offers classes for ages 3-adult. Greensboro Ballet offers an eclectic mix of ballet performances. Each summer, SGB offers a variety of camps, classes and intensives. Greensboro Ballet needs your support!